Our family had a summer home in central Vermont. The property was an old Sugar Maple farm complete with a sugaring off house (shack) where they boiled down the sap to make the maple syrup and a tiny hunting cabin. My father built a house on that hillside, looking down on the valley – which he took great care in clearing the view with his tractor. I loved that house. It sat just below a fresh water spring which my father tapped and brought water into the house. Magical how my parents, without the aid of electricity could make that house come alive – that’s what they do, they just make things happen. One day we went on an adventure and found the Colson family. They had a sign in their front yard. “Trail Rides $5.00” – so we stopped. Much to my delight not only were there horses but children everywhere. Perfect Mom, just leave me here and come back before dark. 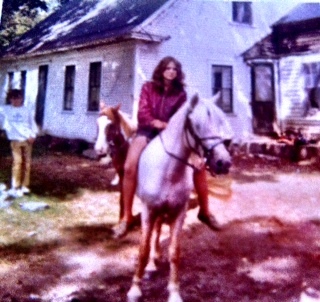 The Colsons were a family of ten, living in an old farmhouse with no running water and every farm animal you could imagine. The kitchen always had a stray chicken, dog, cat and at times the goat. The freezer, which had died years ago had the line up of buckets of water which were fetched from the stream. After a long day of riding we were all hungry so we headed to the garden. Even though my mother had provided groceries for all of us for lunch (which I am sure were put to good use later) we would pick cucumbers and bring them to the kitchen. 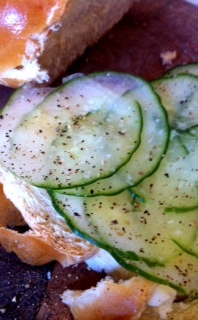 Our sandwiches were fluffy white bread, cucumbers and butter. They always had dirty fingerprints on the pristine white bread and my good sense said to eat around the darkest spots.. I was in heaven. 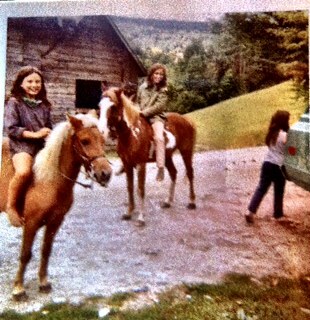 A page right out of Pippy Longstockings and I had the starring role. They were lovely people and they welcomed me into their world. We sold the property years ago and we have lost touch with the Colsons, but I never eat a cucumber sandwich without thinking about my old friends – although I keep my hands a bit cleaner now. This entry was posted in Recipes and tagged Cucumber, Sandwiches. Bookmark the permalink.